NOTE: Please do not perform this procedure on the following Nokia models: C1-01, C1-02, C2-01, C2-02 and C2-05. 1. If your computer does not have Nokia PC/OVI Suite, install the following drivers by clicking here. Restart your computer after installation. 2. Connect your Nokia phone to your computer and select PC/OVI Suite mode on your phone. Wait for it to be recognised by the computer. 3. Download the following program by clicking here. 4. Open the program you've downloaded (Nokia BB5 USB Utility), and click DO JOB. The number 3 next to the Key Code Count means that the number of unlocking code attempts has been exceeded. NOTE: If this screen displays an error, close and reopen it to continue with the process directly. 5. Select "Reset BB5+ Counter (SL2, SL3)" in the menu and press DO JOB. 6. To confirm the counter has been reset, select the first option again and check to make sure a 0 appears next to Key Code Count. 7. 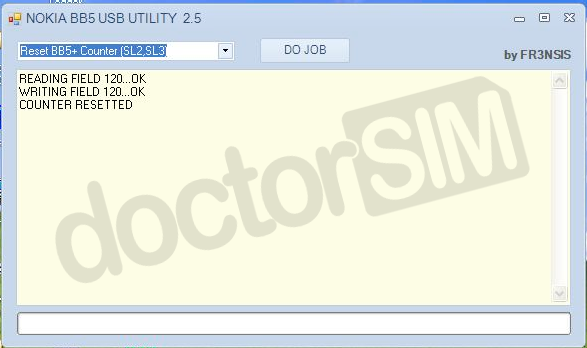 Disconnect your phone from the computer and re-enter the unlocking code sent to you by doctorSIM. 8. Once entered, the "Sim restricted off" message will appear on screen and the phone will restart automatically. Congratulations! Your Nokia phone is now unlocked. NOTE: If the BB5 USB Utility program doesn't work, you will need to install the .NET package from Microsoft. You can download it here.